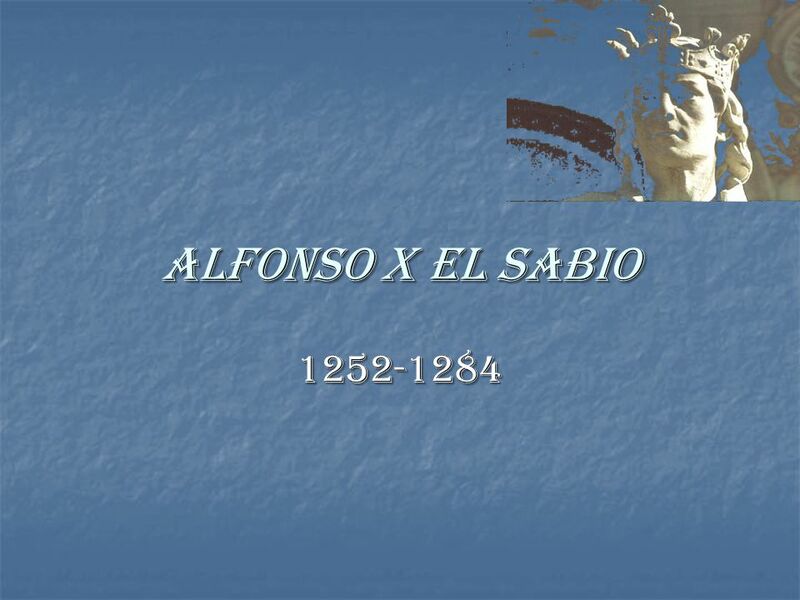 Alfonso X el Sabio 1252-1284. 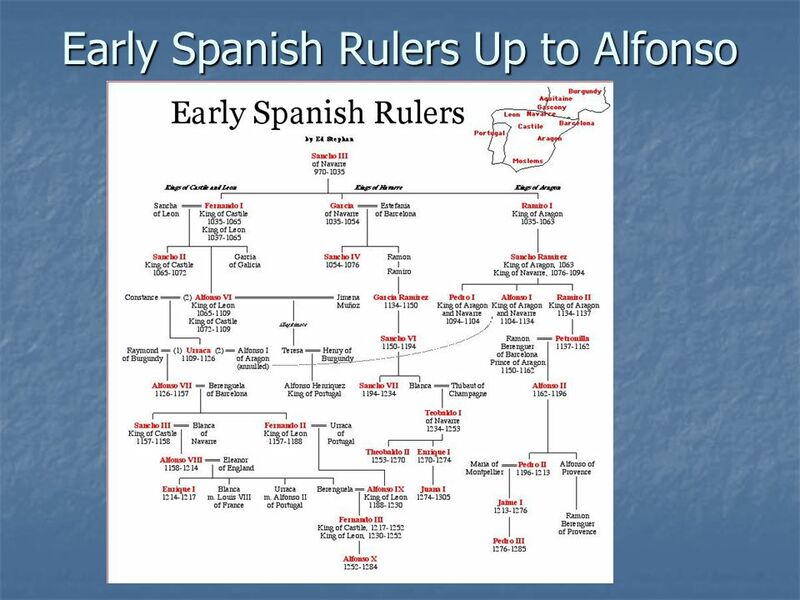 Early Spanish Rulers Up to Alfonso. 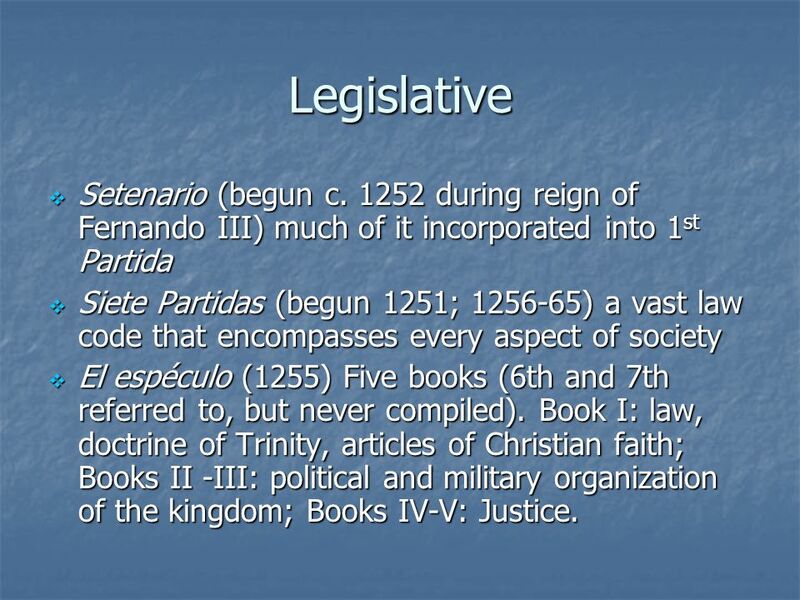 6 Legislative  Setenario (begun c. 1252 during reign of Fernando III) much of it incorporated into 1 st Partida  Siete Partidas (begun 1251; 1256-65) a vast law code that encompasses every aspect of society  El espéculo (1255) Five books (6th and 7th referred to, but never compiled). 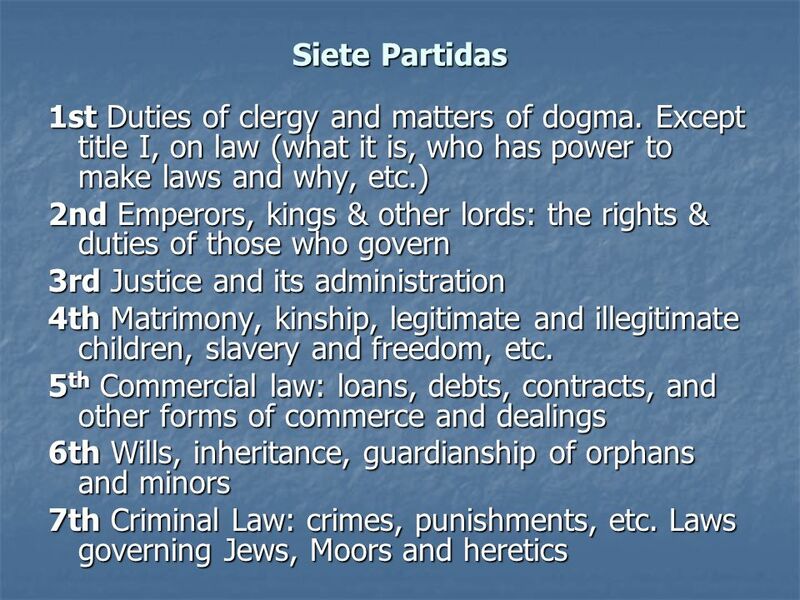 Book I: law, doctrine of Trinity, articles of Christian faith; Books II -III: political and military organization of the kingdom; Books IV-V: Justice. 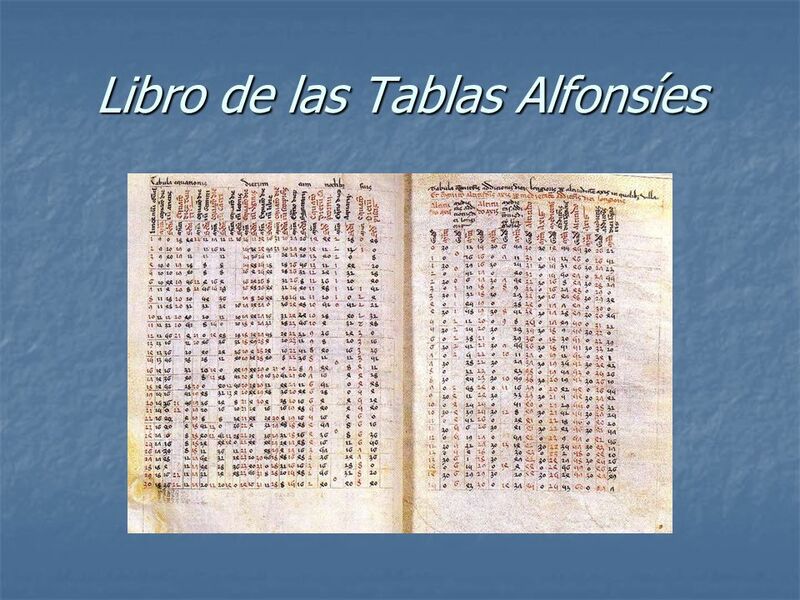 10 Scientific (con’t)  Libros del saber de la astrología. 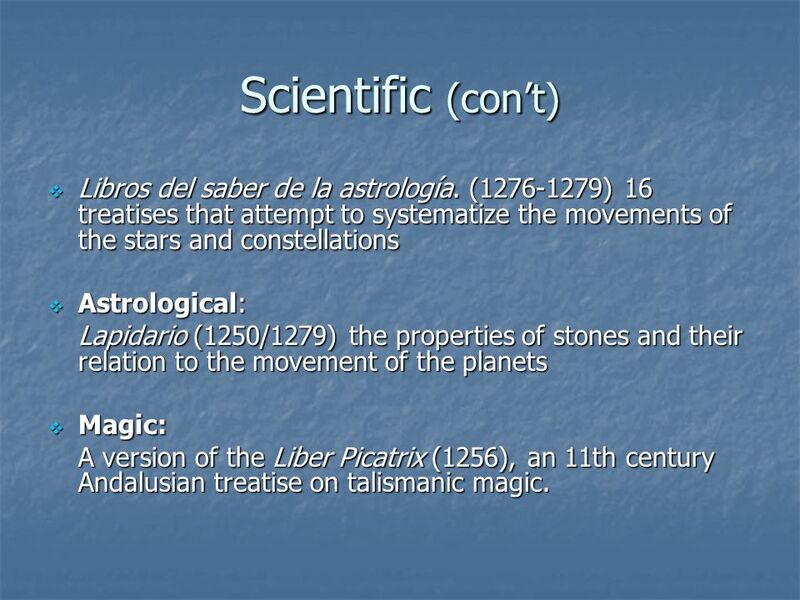 (1276-1279) 16 treatises that attempt to systematize the movements of the stars and constellations  Astrological: Lapidario (1250/1279) the properties of stones and their relation to the movement of the planets  Magic: A version of the Liber Picatrix (1256), an 11th century Andalusian treatise on talismanic magic. 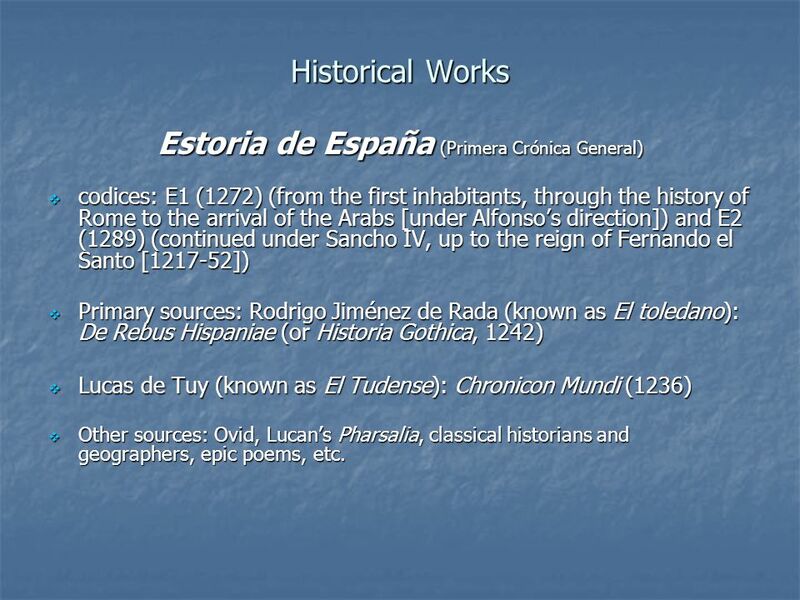 12 Historical Works Estoria de España (Primera Crónica General)  codices: E1 (1272) (from the first inhabitants, through the history of Rome to the arrival of the Arabs [under Alfonso’s direction]) and E2 (1289) (continued under Sancho IV, up to the reign of Fernando el Santo [1217-52])  Primary sources: Rodrigo Jiménez de Rada (known as El toledano): De Rebus Hispaniae (or Historia Gothica, 1242)  Lucas de Tuy (known as El Tudense): Chronicon Mundi (1236)  Other sources: Ovid, Lucan’s Pharsalia, classical historians and geographers, epic poems, etc. 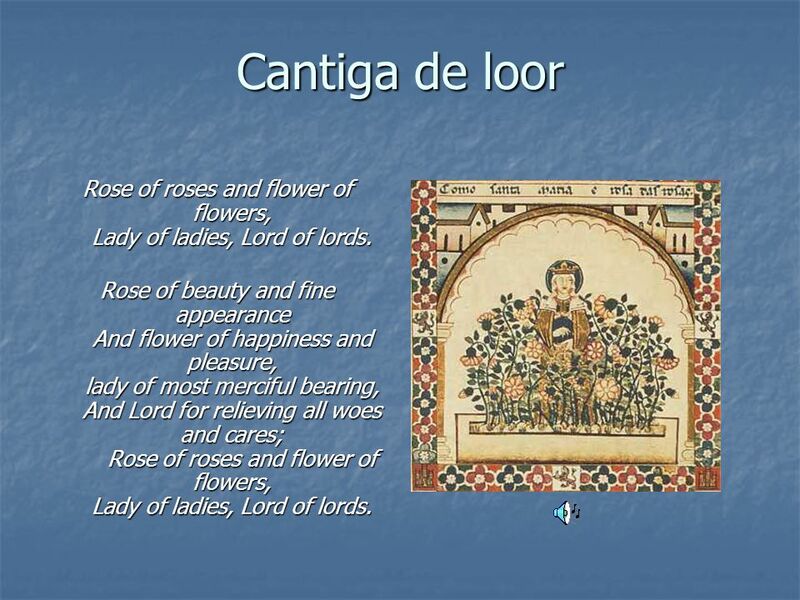 19 Cantiga de loor Rose of roses and flower of flowers, Lady of ladies, Lord of lords. 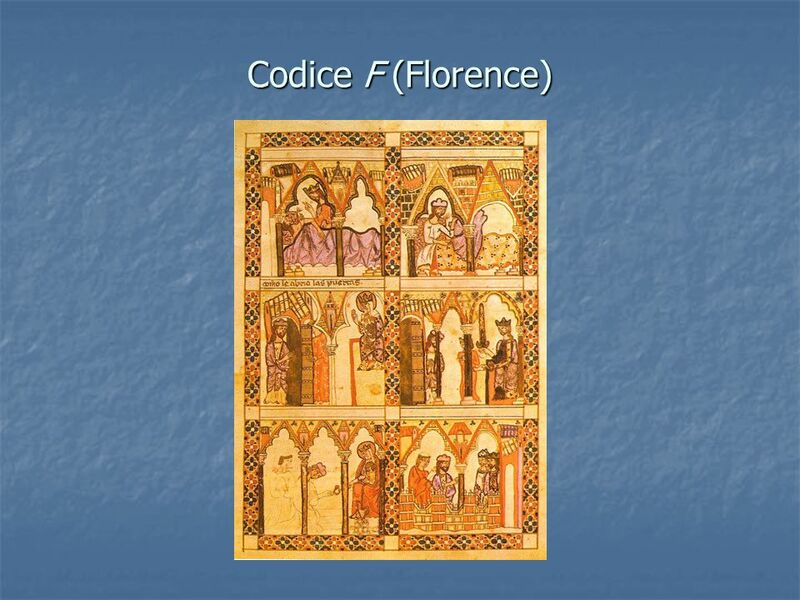 Rose of beauty and fine appearance And flower of happiness and pleasure, lady of most merciful bearing, And Lord for relieving all woes and cares; Rose of roses and flower of flowers, Lady of ladies, Lord of lords. 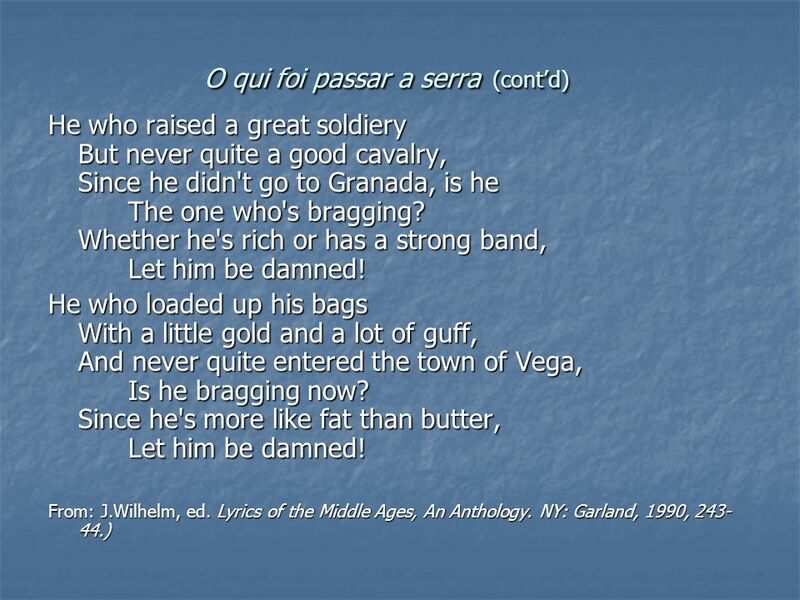 25 Cantigas de Escarnio y de mal dezir  Poetic texts of a satirical nature  Example: "O qui foi passar a serra" In 1264 the Moorish King of Granada raised a rebellion, but in 1265 Alfonso forced him to sign a truce at Vega. 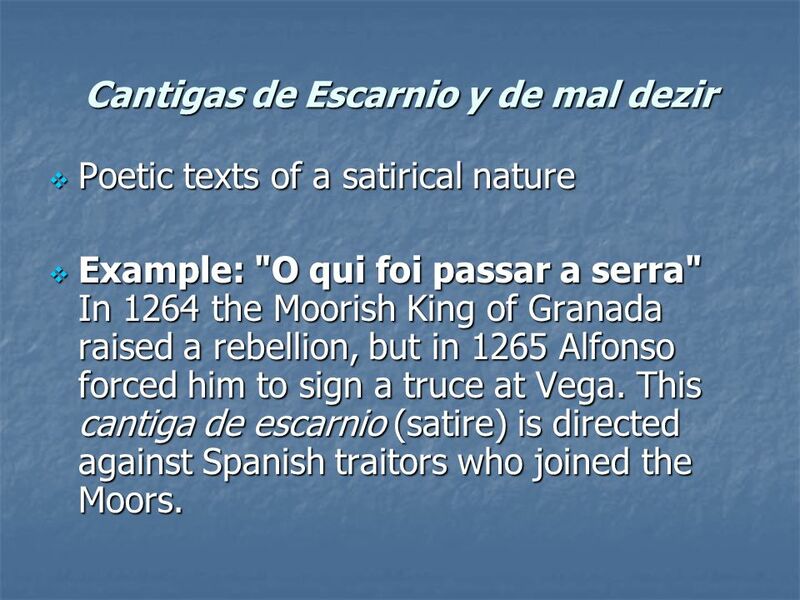 This cantiga de escarnio (satire) is directed against Spanish traitors who joined the Moors. 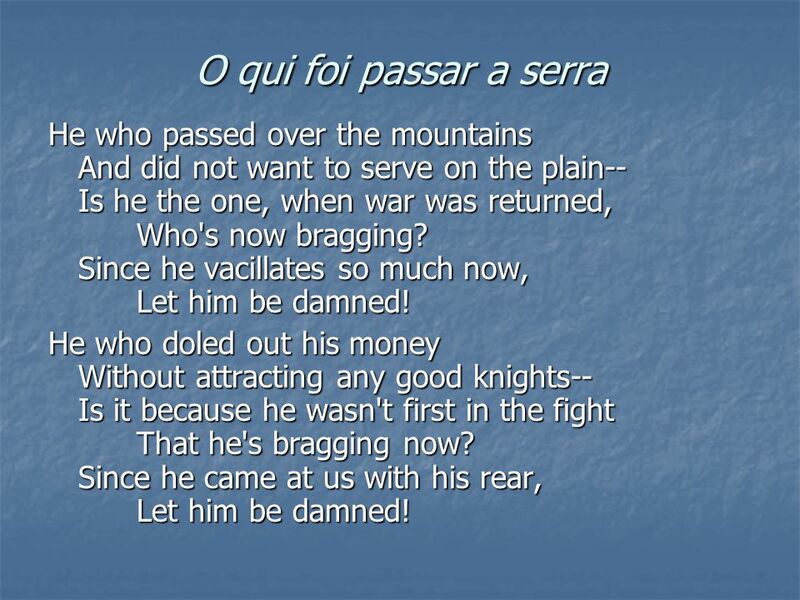 26 O qui foi passar a serra He who passed over the mountains And did not want to serve on the plain-- Is he the one, when war was returned, Who's now bragging? Since he vacillates so much now, Let him be damned! He who doled out his money Without attracting any good knights-- Is it because he wasn't first in the fight That he's bragging now? Since he came at us with his rear, Let him be damned! 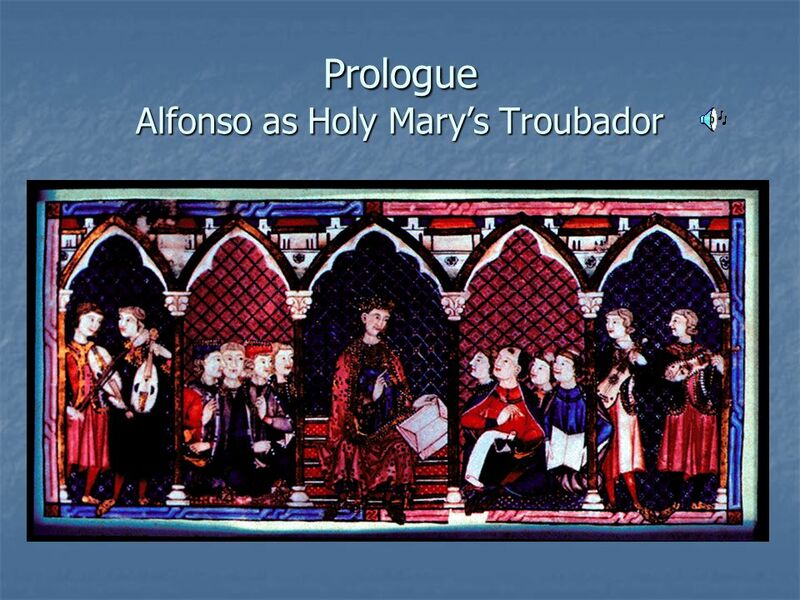 Download ppt "Alfonso X el Sabio 1252-1284. 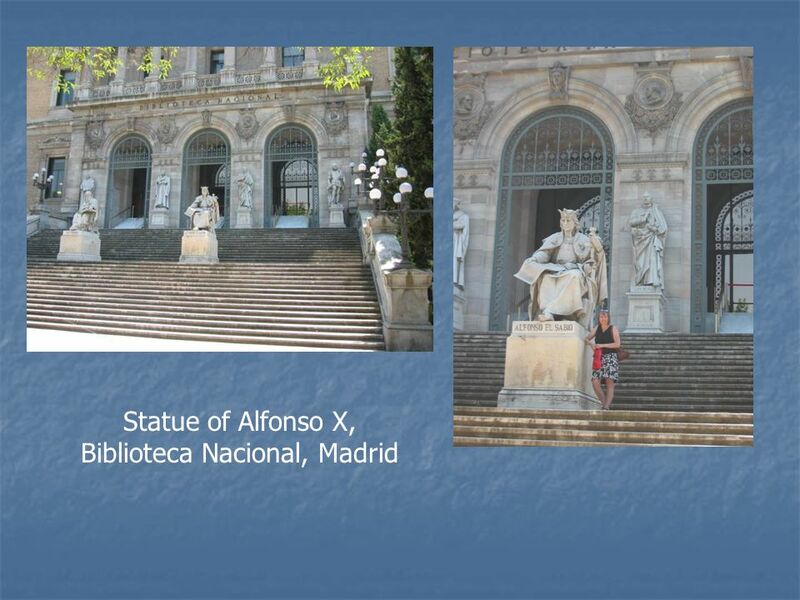 Early Spanish Rulers Up to Alfonso." El Cid By Zachary Kidson. 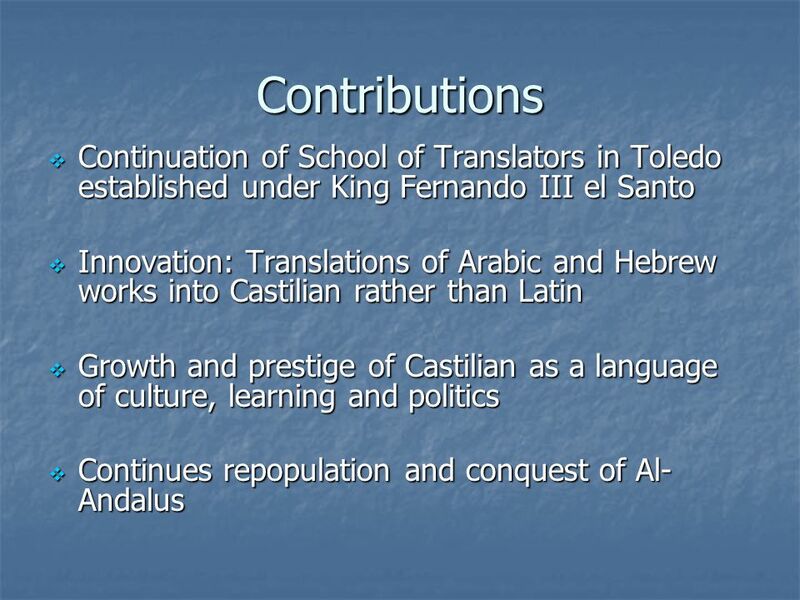 COMENIUS REGIO SPANISH: ITS HISTORY AND EVOLUTION. 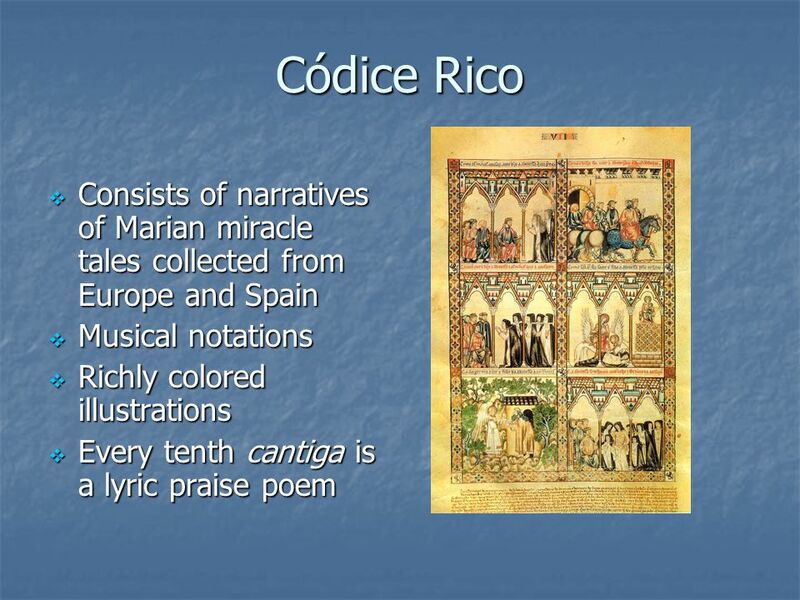 CONTEMPORARY SPANISH. 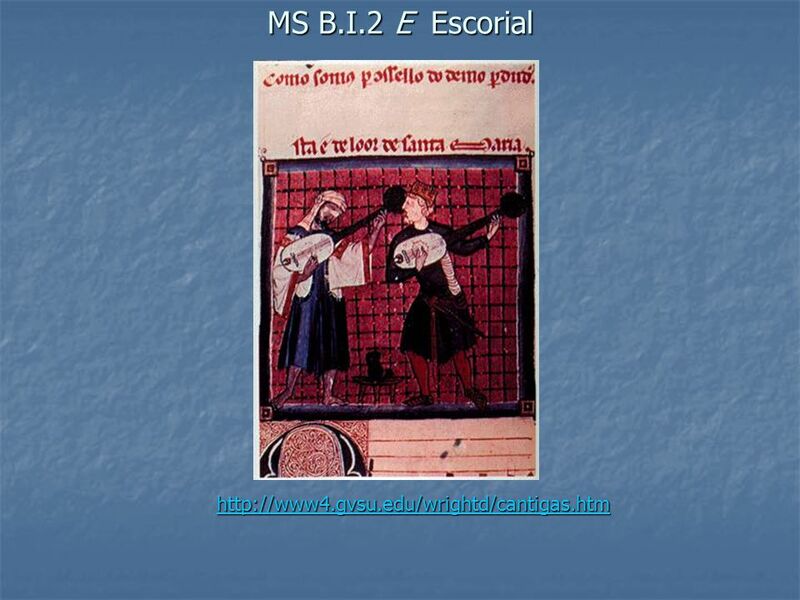 Absolutism Global I: Spiconardi. Absolutism Absolutism  When a king or queen who has unlimited power/centralized control of the government and seeks.  1. 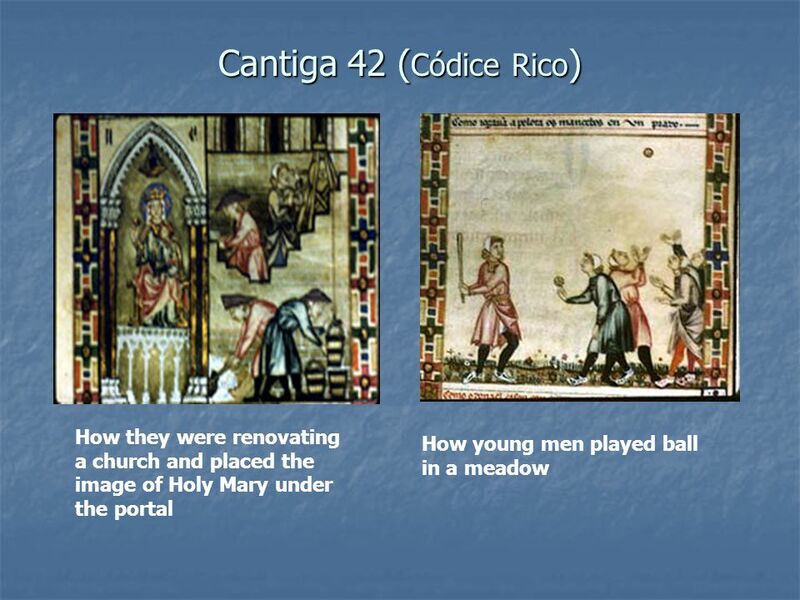 How was the Roman Catholic Church a powerful force during the Middle Ages?  2. 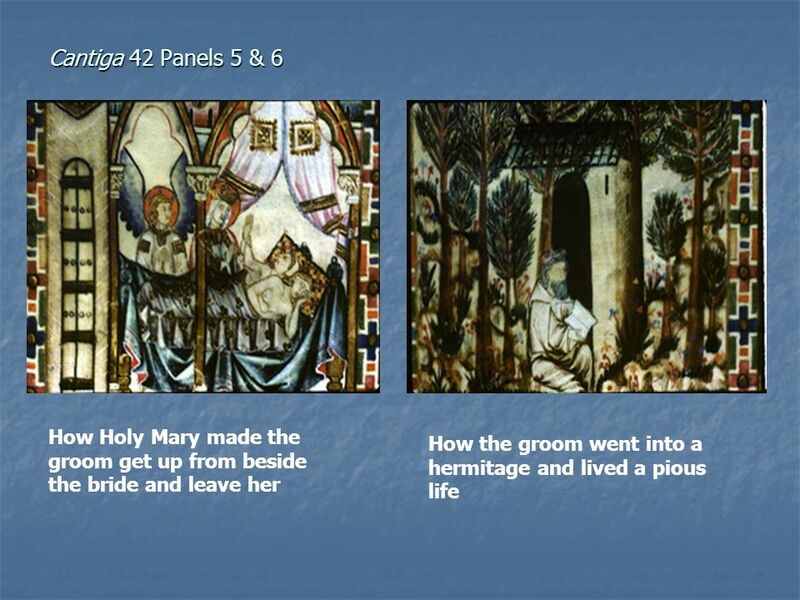 Analyze the power of the Church with feudalism. 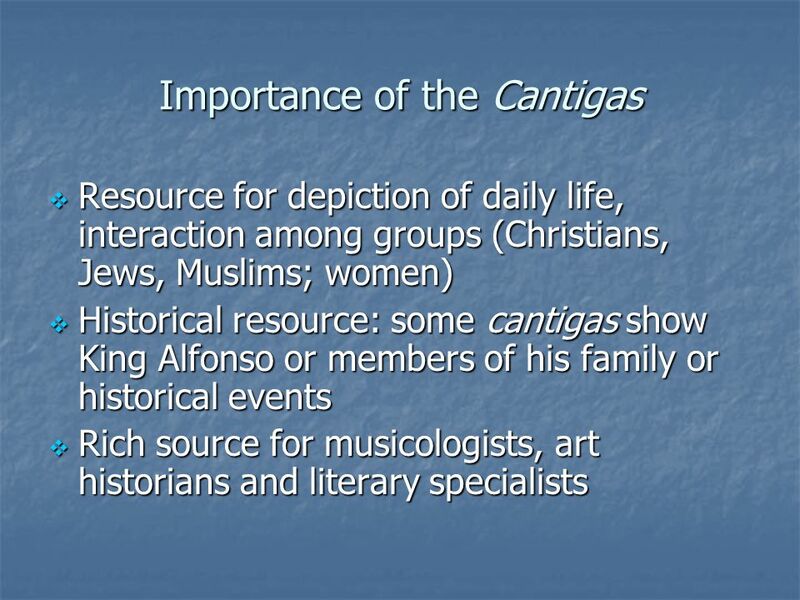 Objectives Explain how the Church shaped medieval life. 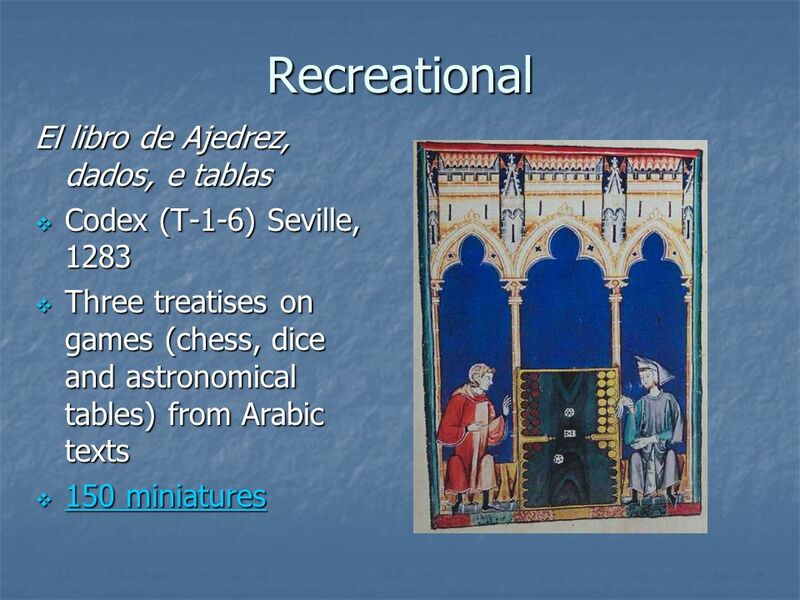 Early Middle Ages Through the Crusades. England  1066 William the Conquer becomes William I of ________  1215 King John loses lots of land in wars of. The Tudor Monarchs Henry VIIHenry VIII Edward VI Lady Jane Grey Mary I Elizabeth I. Early Life Born on April 22,1451. 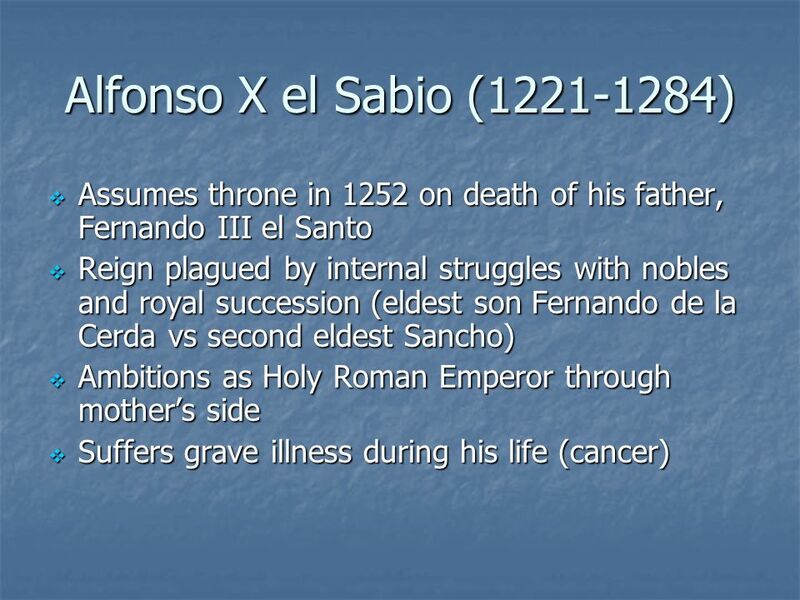 Born on April 22,1451. Birth place Madrigal de las atlas Torres. 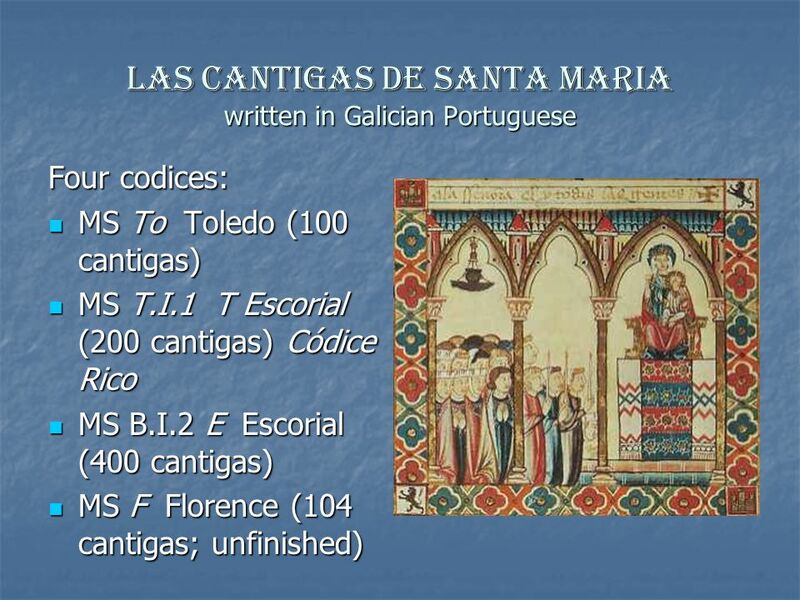 Birth place Madrigal de las atlas Torres. She was often. The Tudor Monarchs Henry VII Henry Tudor’s victory over Richard III at the Battle of Bosworth Henry Tudor’s victory over Richard III at the. 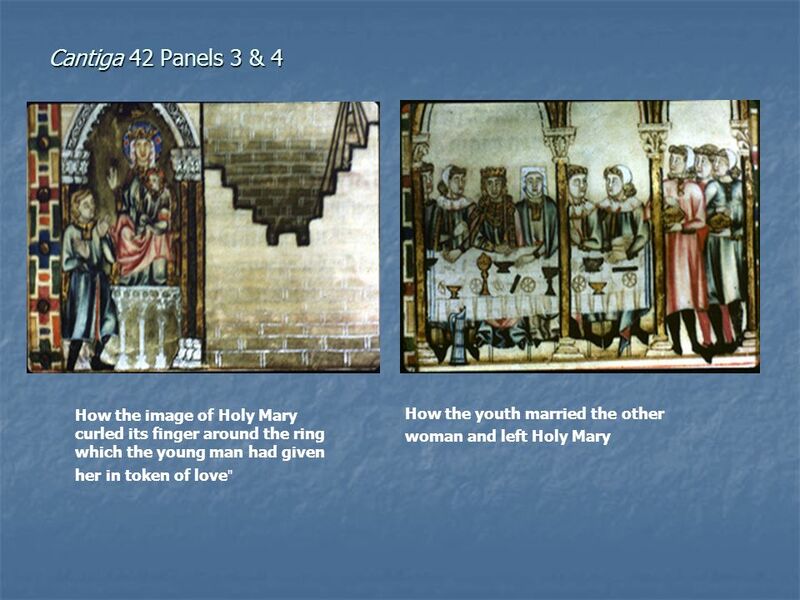 The Middle Ages; Ch 13, section 3: pages Medieval (Latin for “middle ages”) Europe CE Kings and Queens Lords and Ladies Kingdoms and Castle. 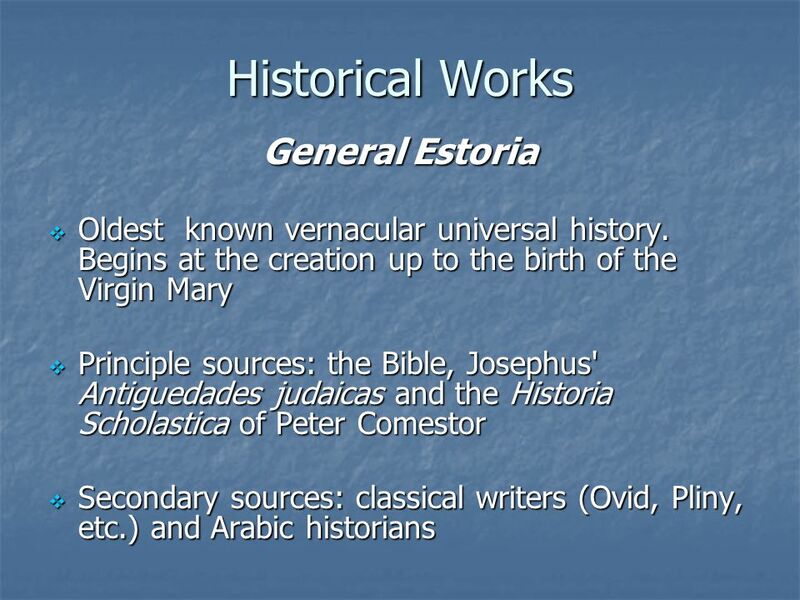 HISTORICAL ROOTS OF LAW Unit 1 Heritage. 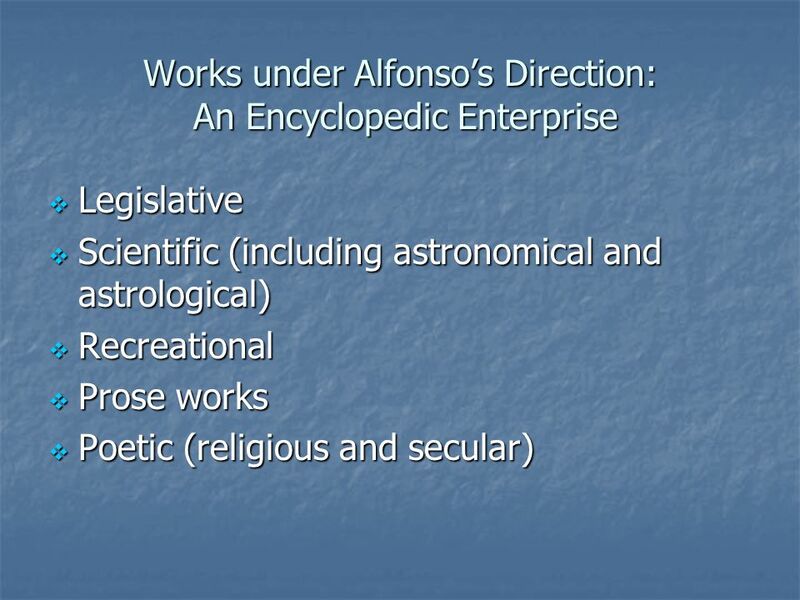 Early History of Law Early societies- local customs and beliefs- unwritten and dealt mostly with property and. 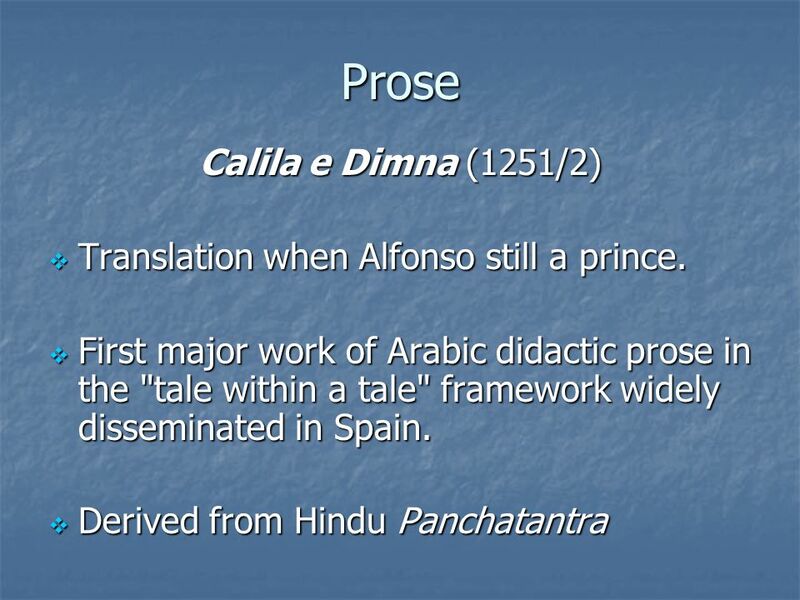  Was the first writer to show that English could be a respectable literary language. 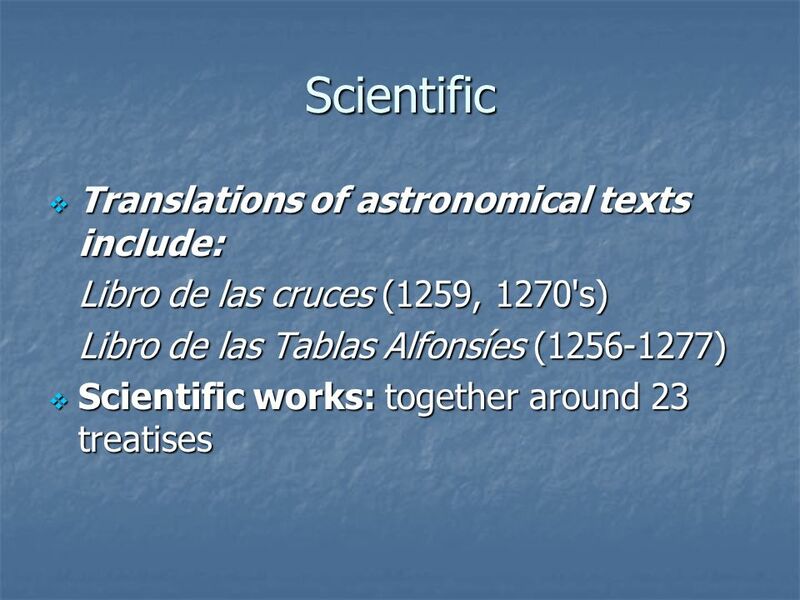 › Most texts at the time were written in Latin.  Chaucer was born.